Over a period of time, it is possible for the springs to relax. Therefore it is suggested you check the tension at the time of installation and periodically over the course of a year. The spring tensioning device that comes standard on all doors makes this process virtually effortless. Raise and lower the door to test the door balance. If the door is easy to close but hard to open, you will need to add spring tension. If the door is hard to close but easy to open, you will need to remove spring tension. For a "cold" door that needs additional tension, offset the balance of the door by positioning the bottom bar ten inches below the opening header. Carefully insert a winding bar or screwdriver into the ratchet tension device located on the left bracket. Slowly rotate the tension device in a clockwise direction until the door begins to open and the ratchet clicks and locks into the next position. For a "hot" door that needs tension removed, place the curtain in a fully open position. Insert the winding bar into the tensioner and apply a slight amount of pressure so that you can carefully lift the ratchet pawl. 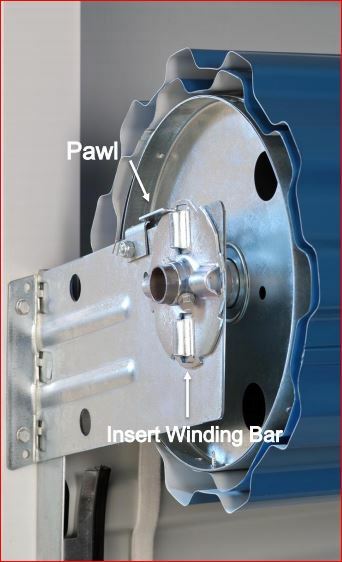 Then, while rotating the tension device in a counterclockwise direction, carefully release the pawl to allow it to lock into the next available groove.